So yes, Chooch leads everyone in batting average with .361. That is better than past MVP’s Joey Votto and Josh Hamilton. Ruiz has also outhit fellow catchers and All-Star voting leaders Yadier Molina and Brian McCann. Soooooo….VOTE FOR CHOOCH! We have until Thursday to get him to the All-Star game! 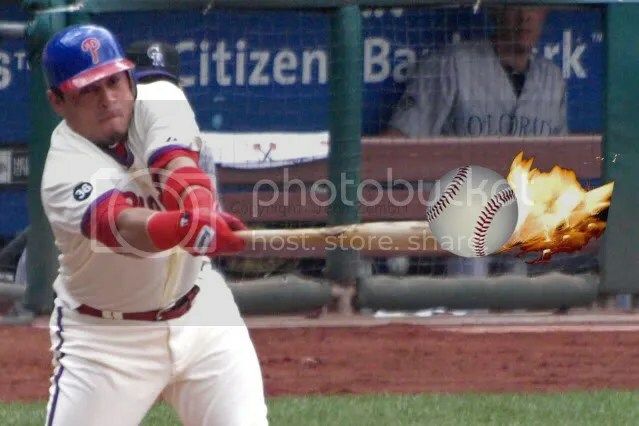 But even if that fails, manager Charlie Manuel told reporters yesterday that he plans on calling Tony La Russa, the NL All-Star team manager, to plead the case for Chooch. Manuel always sticks up for his players, but especially in this case, Ruiz really deserves the honor. Chooch put his stamp all over last night’s win. He went 3-for-4 with a homer and 2 RBI. And while catching, Ruiz saved two runs from scoring by blocking the plate and tagging out the runners. The biggest of those plays came in the 7th inning after starter Vance Worley got into a real jam. With no outs, 2 runners on base and 1 run already across, Worley was removed and rookie Michael Schwimer took over. Schwimer coaxed a ground out and then a short fly ball to left. One the fly ball, John Mayberry Jr. made a great throw home, which Ruiz caught and tagged the runner for an inning-ending double play. 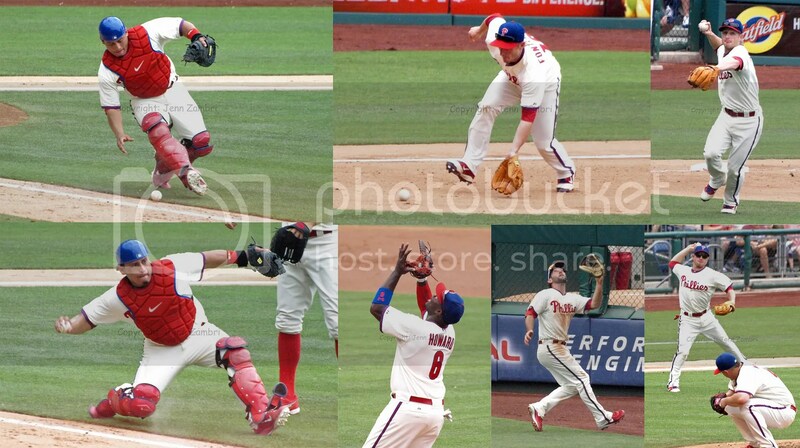 That play kept the Phillies lead intact and Chooch’s subsequent homer added to that lead. The home run he hit in the 8th turned out to be a game saver as closer Jonathan Papelbon struggled in the 9th, allowing a solo homer. But the Ruiz blast made the difference in the 5-4 win. The Phillies have now won 2 of the first 4 games against the Pirates, which is great news; because tonight’s 7:05pm game is going to be started and finished by the Phillies bullpen. The rainout on Friday forced a juggling of the pitching staff, leaving them 1 starter short this week. So Raul Valdes will start the game and likely pitch 3 innings, passing the ball on to the rest of the pen after that. And while you are watching the game, do not forget to VOTE FOR CHOOCH! With a 3-2 victory over the Braves last night to win the series 2 game to 1, the Phillies will have an 8-game lead in the NL East over both the Braves and the Marlins going into September. Joe Blanton pitched another beautiful game and got through 7 innings of one run ball; the only run came off a solo homer from Martin Prado in the first inning. Blanton looked a bit shaky through those first few innings, but settled in well and only gave up 3 hits. 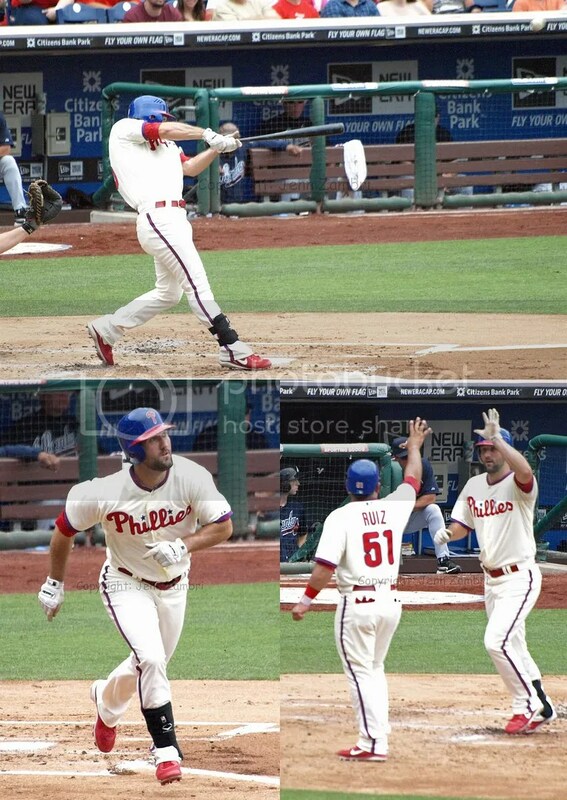 And for the 2nd night in a row, Chase Utley went yard; his solo shot to right field in the 4th was the only run for the Phillies until Carlos Ruiz stepped up in the 7th. In honor of the Ruiz backpack night, a giveaway for kids 14 and under, Ruiz smacked a double to left to score Raul Ibanez and Pedro Feliz. Ruiz went 3 for 3 on the night; it was his 5th 3-hit game of the year. 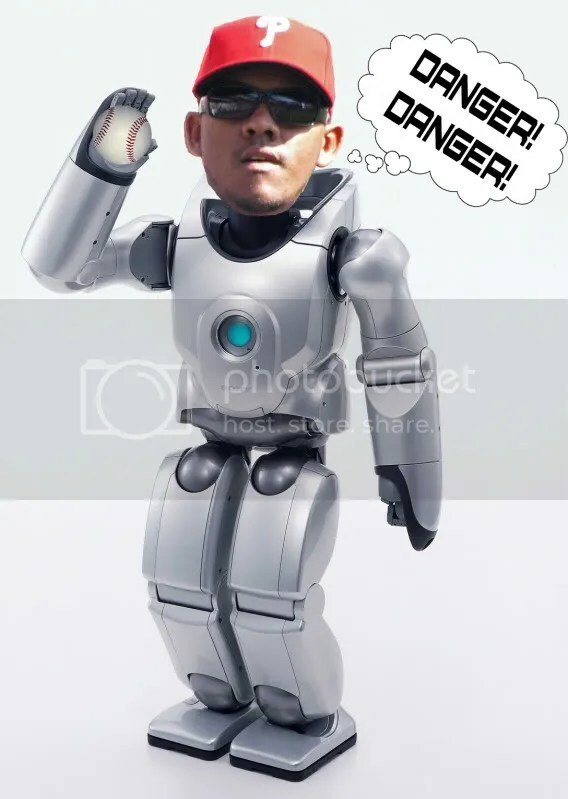 Maybe the Phillies should give away a Ruiz bobble head next? In the not-so-great offensive category, the Phillies are still struggling with runners in scoring position. They left 14 men on base and again, had the bases loaded with no outs and failed to score. Blanton hit a line-drive to first base and Ruiz was double off after the catch. 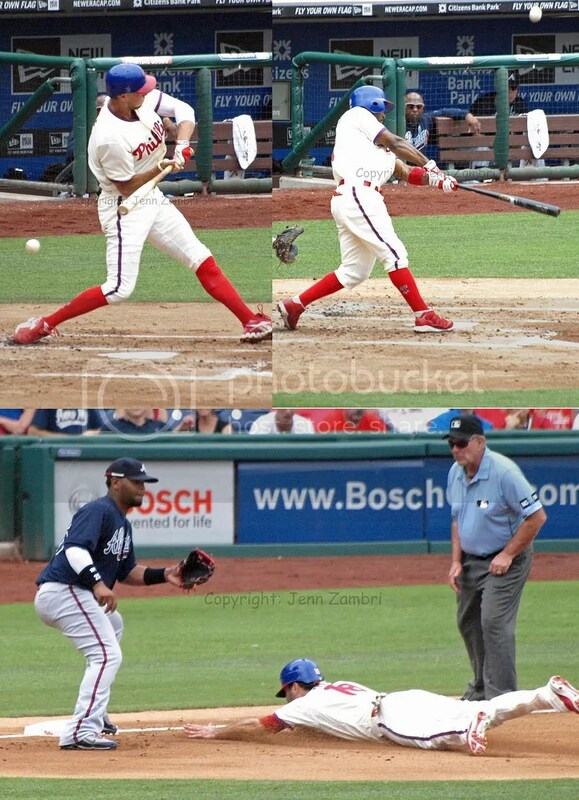 Jimmy Rollins then hit a weak grounder to end the inning. The offensive outage is concerning, but thanks to great pitching, they came out on top. Defense was a big part of the win as well. Ryan Madson, who is entering Brad Lidge-bad territory, got into a huge jam in the 8th inning again. He hit the first batter he faced and then gave up back-to-back singles which scored a run for the Braves. Without recording an out, he was removed from the game and Scott Eyre took over. Brain McCann then hit a sharp grounder to Utley, who fielded it perfectly and flipped to Rollins who threw to Feliz at third; Feliz tagged Chipper Jones for the unusual 4-6-5 double play. 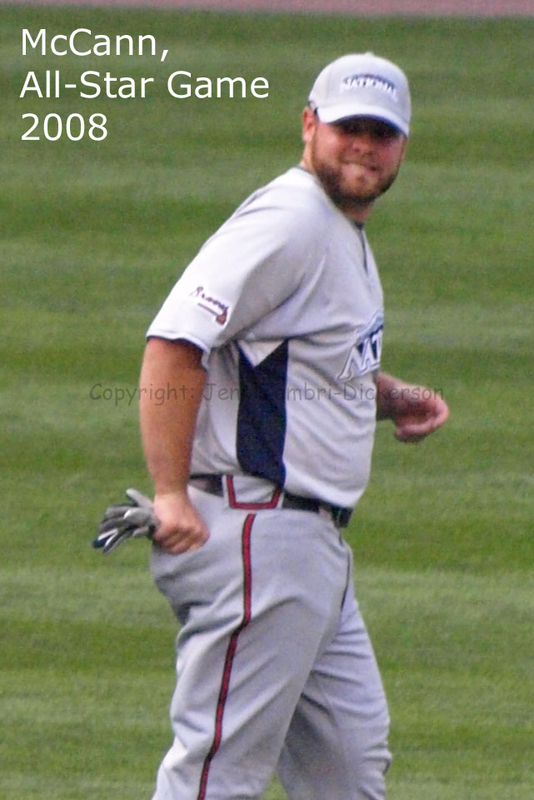 Having eliminated the lead runner, Eyre saved the Phillies from disaster and gave Lidge a 3-2 lead to work with. Amazingly, Lidge nailed down the save with relative ease; it was his second save in a row. Whew! By the way, did anyone see the actor, Paul Rudd (movies: “I Love You, Man”; “Anchorman”; “Knocked Up”), sitting in the 10th row behind home plate last night? He was just a few sections over from me so I took a few photos. The woman next to him (right side, dark brown hair) is none other than Jen Utley, Chase’s wife. A very welcome off-day is upon us as the Phillies offense needs to rest and charge up for the September charge. 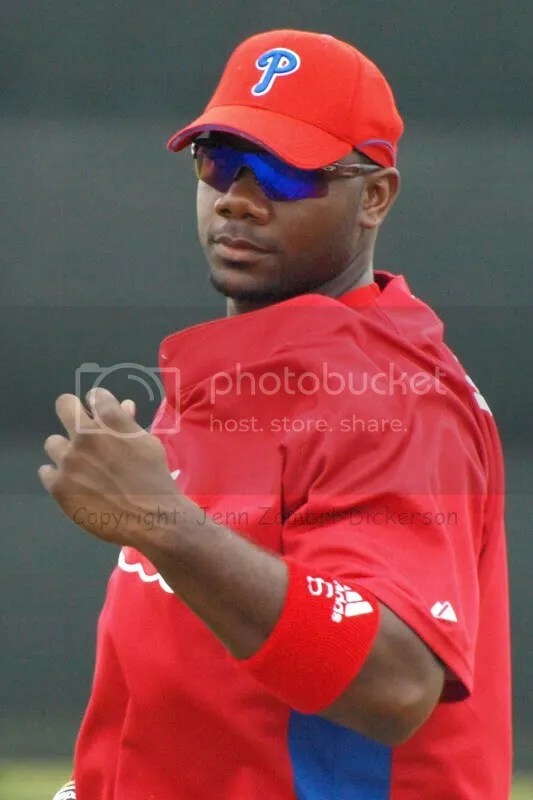 Watch for September call-up’s which may include pitchers Kyle Kendrick, Jack Taschner and Rodrigo Lopez; infielders Mike Cervenak and Andy Tracy; outfielders John Mayberry Jr. and Jason Ellison; and we will likely see a catcher added – maybe Paul Hoover. Those are my guesses anyway. A lot of moves will be made as the Phillies are also anticipating the return of Brett Myers, JC Romero and Clay Condrey to the bullpen plus Greg Dobbs. All four have been on the DL and are very close to coming back. 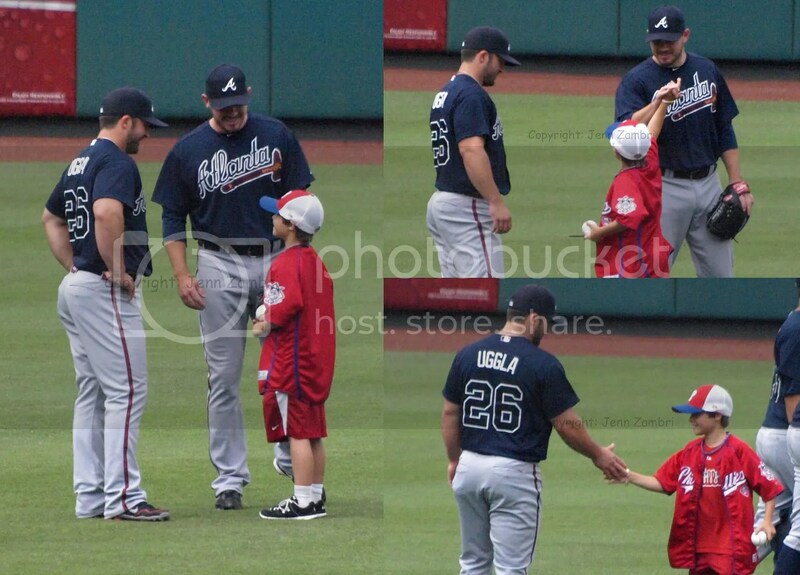 And finally, here is the complete Photo Album from last night’s Phillies – Braves game. Tomorrow, the San Francisco Giants come to town for 3 games and some serious pitching battles will ensue. You may remember the Phillies were stomped in San Fran back in July, losing 3 out of 4 games. The Giants are tied for a wildcard spot right now so this will be a very tough match match-up. Cole Hamels starts it off tomorrow at 7:05pm. For a change, the Phillies got a great outing from a starting pitcher; JA Happ went 7 innings and only allowed 2 runs. However, Ryan Madson, who has been nothing short of awful lately, was still sent out to pitch the 8th inning, despite his troubles. Madson gave up 3 runs and threw away any possibility of a win for the Phillies. Madson has made a habit out of blowing games in the past month and manager Charlie Manuel is doing him no favors by continuing to put him on the mound. Clearly, Madson has issues to straighten out and during tight games is not the time for him to “work” on his pitches. Manuel cannot keep putting the same guys out there and expect different results; especially when the team is on the verge of being swept and coming off a horrible road trip. Well, they got swept alright, and it was ugly. Not only that, but as I predicted, they are now nearly out of 1st place (tied with Marlins) and quickly plummeting down the ranks of the NL East. Manuel needs to deal with the players that are not producing and dealing with them should not include putting blind faith in players when things have gotten this bad. Jimmy Rollins did attempt to turn his season around tonight; he went 2 for 4, but it was all for nothing. 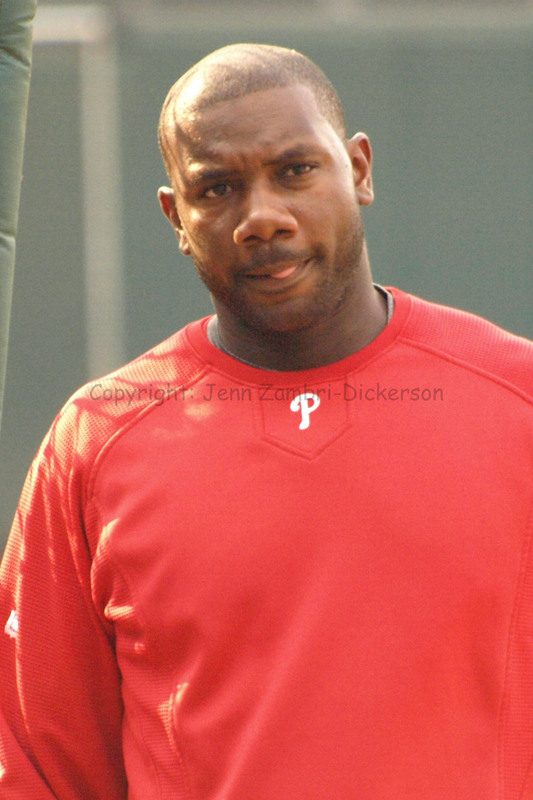 The entire game, the entire road trip, has been an exercise in futility as the Phillies cannot seem to win a game. 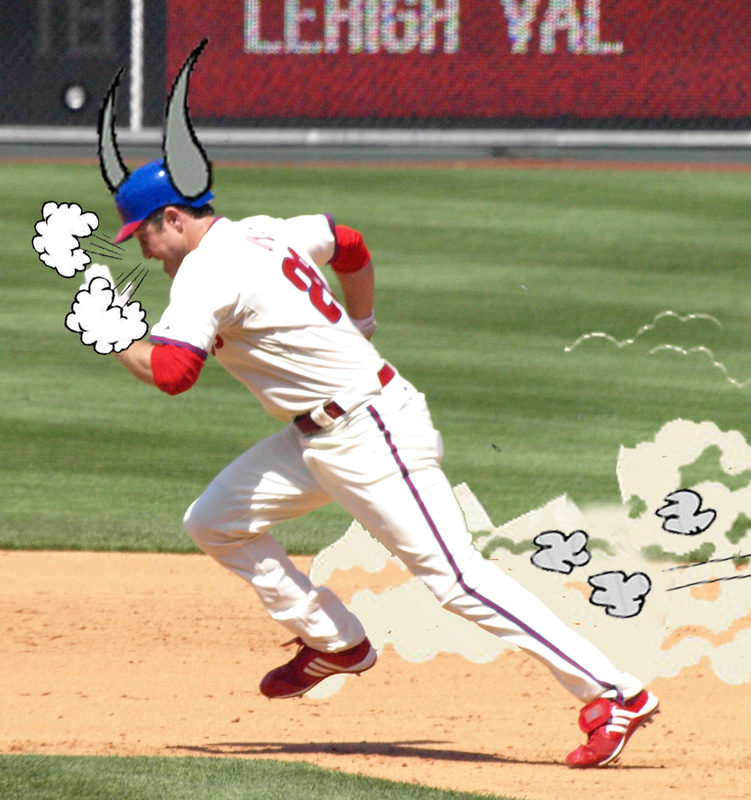 The only real entertainment tonight was watching Chase Utley impersonate a charging bull, as he slammed into the Braves catcher, Brian McCann, to score the first of only 2 runs for the team on the day. Greg Dobbs had a nice day as well, but again, it did not matter. The Phillies struggled in the first half of last season, and they still won the World Series. However, the struggles this year are a completely different animal. 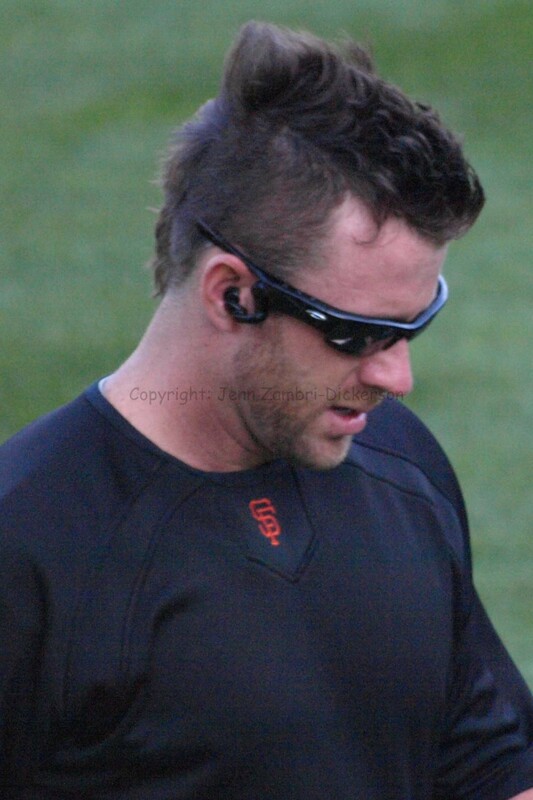 Mental errors, lapses in judgment and very bad pitching have thrown 2009 into a much different level of awful. It is officially time to be worried, Phillies fans. This team has let a potentially big lead in the division wander on by and now, nothing is going right. One Last Time – Vote! Only a few hours left! 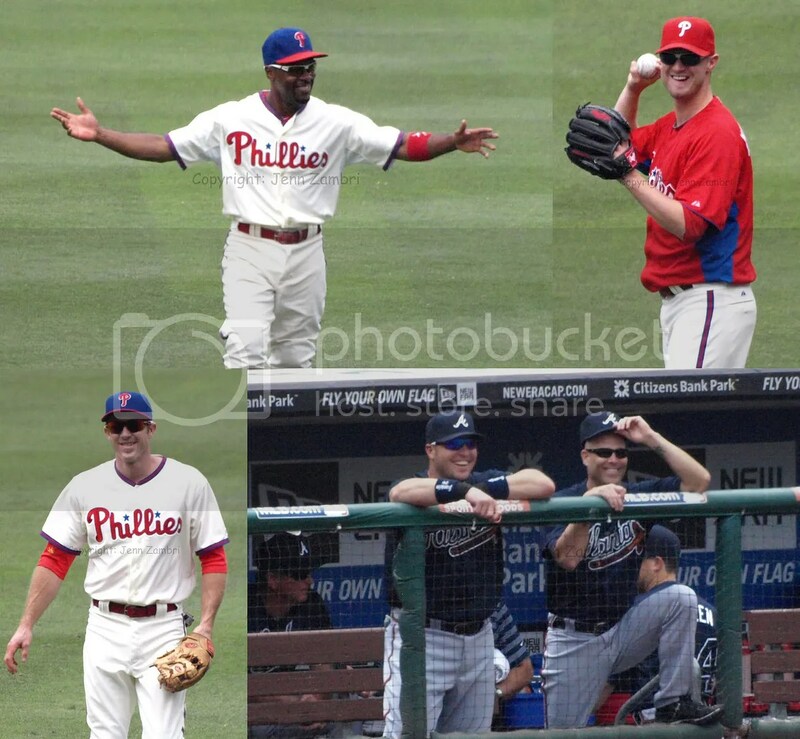 Please ignore how bad this team has gotten and keep VOTING for your Phillies All-Stars! (I need something to look forward to) VOTE up to 25 times. Voting ends at 11:59 PM ET tonight! Utley & Ibanez should be locks for a spot, but Howard, Victorino and Rollins are still teetering on the brink…so, keep on voting!